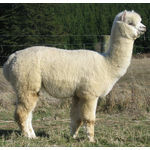 Flagstaff Alpacas offers a variety of stud choices through fully or partner owned stud males. 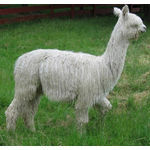 We offer a number of options on stud males at Flagstaff Alpacas and, with the 'Alpacamobile' can deliver and complete mobile matings as well as short and long-term leases on individual alpacas - please contact us for more information. 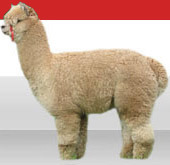 New fleece statistics for December 2014 shearing recently added. 'Elvis', Tabourie Ben Elvis, our solid blue-black stud male - is a very reliable breeder - and latest fleece stats (Dec 2013) of mean 25.1 micron, SD 5.9! With five black females in our own herd who are 'Elvis' progeny he continues to produce a soft feel and blue-blackness to his fleece matching his upstanding confirmation. 'The Stallion' ... 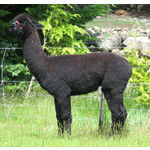 This super-fine alpaca stud male gets better and better. You really must touch his fleece ... mean 19.0 micron at 32 months, 21 micron aged 41 months, 21.5 micron aged 11 years ... very soft. 'Otto'... Ottoman IAR 49001 ... our fibre king who loves "the chicks"! His crimped fleece shines out as he 'strutts his stuff'. Don't rule Otto out of your breeding programme until you have seen him! 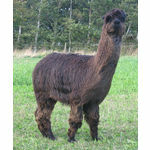 Otto is also offered for sale - a proven male at $1,000+GST. 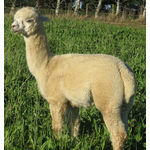 QC is our suri 'powerhouse' amongst our stud males with his bright white suri fleece. QC has a wonderful, rich, tightly locked suri fleece on a solid frame. His genetic background includes Senator, Raphael, and Amador. 'Castel' ... Sherlin Chaka Castel ... is one of two Suri's in our line-up ... now happily working this rare charcoal dark-grey male takes Suri-pride in his work! 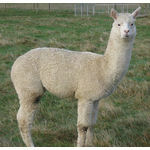 'Amers' ... Ambersun Amaretto: A bright white fleece that is still show quality. 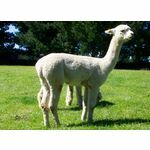 We have a number of senior cria or Amaretto available to inspect with their own cria - all carry his dense and crimpy fleece. 'Ammers' is also a quality option over coloured fleece - improving the quality while retaining the colour characteristics on the dam. Latest fleece stats (Dec 2013 - aged 12 years) Mean: 25.4, SD 5.8, CV 23, Comfort Factor: 85%.